The 'Ten Little Injuns' from Philadelphia. "All those people, all those lives..."
Angel or Devil. Or just girls having fun? From Wales to Broadway ... with Bells on! The first modern Olympic Games .. So, I looked back to yesterday, when there was a nice photo, but at a ridiculous price, of George Honey. Of the original Pyne and Harrison company. Should I ‘do’ him. Just check first and make sure someone else hasn’t. Eh? What? Here’s a nice little piece on him, with a picture of his grave. Someone who evidently isn’t a theatre specialist, rather a graveyard specialist, has nevertheless put together a well-researched piece. Perhaps I won’t ‘do’ George. But what is this? A tentative suggestion that he might have been connected to the well-known Mrs [Laura] Honey? Oh no, that can’t be. So that was me hooked. And I’ve wound in and out of the Honeys all day. Firstly, blow me down, Mrs Laura Honey is in the Dictionary of National Biography. Well, OK. The more the merrier. And she got quite a detailed obituary in a couple of papers when – like James Dean and Marilyn Monroe – she died young, at about 26 years of age. Put the one with the other and that means, yes! She has a Wikipedia article. Well, there isn’t a heck of a lot of room, in 26 years, to go wrong, but … here’s my version. We start with a Hampshire shoemaker, by name Frederick Bell, who had a little daughter whom he christened Anne. She was a pretty little Anne, and she sang delightfully, and in her early teens she began singing in public. The biogs say the first was at Gosport in 1814, but the first sighting I have made is, a little later, at a Benefit for one legged man who had broken his other leg … ‘Miss Bell sung several airs in a most inimitable manner, and was warmly and deservedly applauded’. 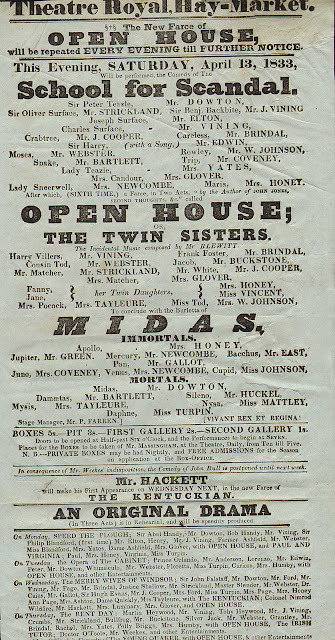 By 1817, I spot her singing Julia Mannering (‘sung her songs in a style that gave great satisfaction’) at Southampton’s Theatre Royal. However, Miss Bell’s venture into the big world was fraught with peril, and on 6 December of 1816 or 1817 (the articles don’t agree, and I have no evidence) she gave birth to a little Lauretta Martha Rosier Bell. I can only assume that ‘Rosier’ was the father, unless she was conceived behind a rose bush. Fast forward a bit. 28 November 1823 Anne Bell got legal. She married one John Young 'artist', and produced some legitimate children. I spot only a John William (6 March 1831) and a Fanny (1834), before Mr Young evidently clocked out. And by which time teenaged Laura was a married woman and well-and-truly established as a delightful singing soubrette on the London stage. Laura had married, 13 October 1831, a lad around town by name William Honey. The two had a daughter, after which Mr Honey went boating on the Thames on the 8-ton Lady Emma. The boat tipped over, off Lambeth Palace, and most on board were drowned. Including William. 17 July 1836, Laura was a widow. Laura died in 1843. Mr Gaston survived her. And so did her two children. Her will -- yes, at 26, she made a will, three months before her death? don’t tell me that she didn’t know she was, for some reason, doomed – nominates Gaston as guardian of her children, Laura (legitimately born 26 May 1834) and ?Ada. Mr Gaston in the 1851 census is looking after just ‘Anne, born Jersey, aged 10’. But mother! Mrs Young is still going strong! 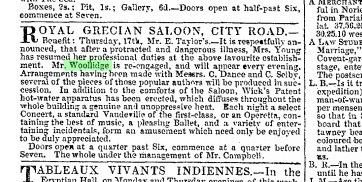 In 1840 she is acting and singing at the Grecian, and on the bill is a fairly lowly tenor, by name Tom Woollidge. I wonder if he’s the same person as the Tom Newman, with whom she is living in the 1841 census. Anyway, she married the man. 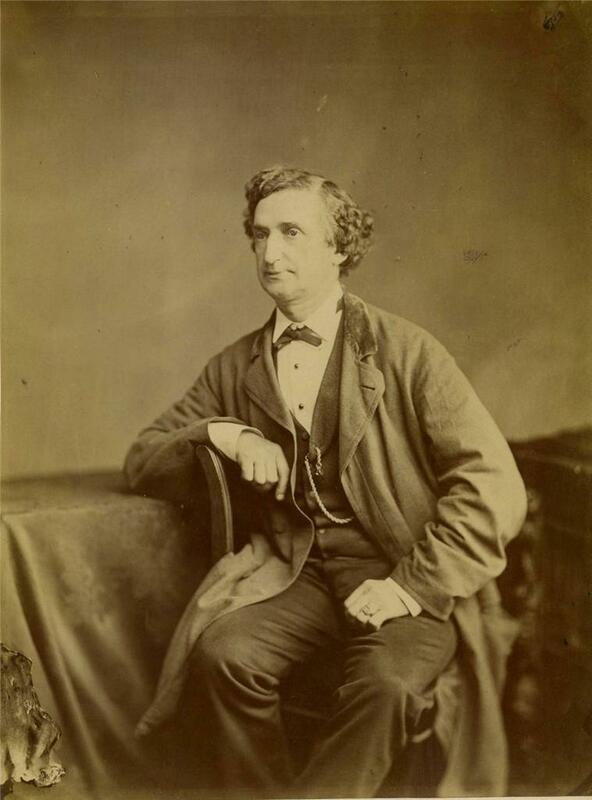 And as Mrs Woollidge she would remain, through her long career, until she was laid low by a stroke, after nearly half a century on the stage, in 1861. End of story. Oh no. (1) Fanny Young. Mrs Honey’s legitimate younger sister. 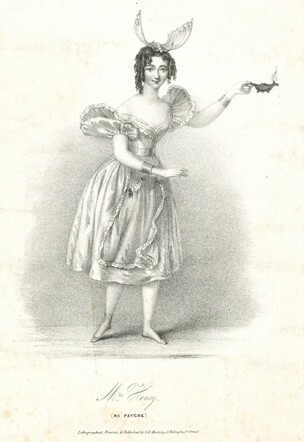 Fanny also made something of a theatrical career, and played for a bit in London. 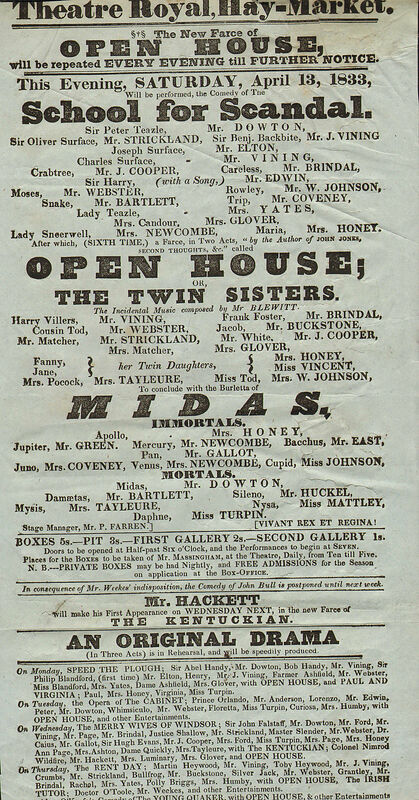 But she made her home in Bristol, and worked largely in the Bath and Bristol theatres, up till her death, aged 29 (39 Queens Square, Bristol 8 March 1860). (3) Actress ‘Marie Dalton’. CLOSE relation to Mrs Woollidge ... presumably not legitimately, or … but why did Laura jr have Dalton for her middle name? Well, it appears that there is a man at the bottom of it. One David Dalton Kennedy. And Laura jr wasn't the daughter of Mr Honey. I wonder who knew that. But who is Marie Dalton, attached to the previous generation. Honestly, what a family..
And I have spent a whole day on THIS?